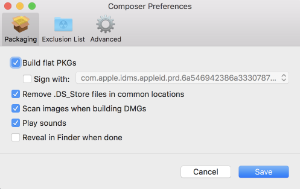 You can access Composer preferences by choosing Composer > Preferences from the menu bar. This section provides a detailed explanation of Composer preferences. Composer allows you to customize the toolbar by adding and removing items. To add items to the toolbar, Control-click (or right-click) the toolbar and select Customize toolbar, and then drag desired items to the toolbar. To remove an item from the toolbar, simply drag the item off of the toolbar. 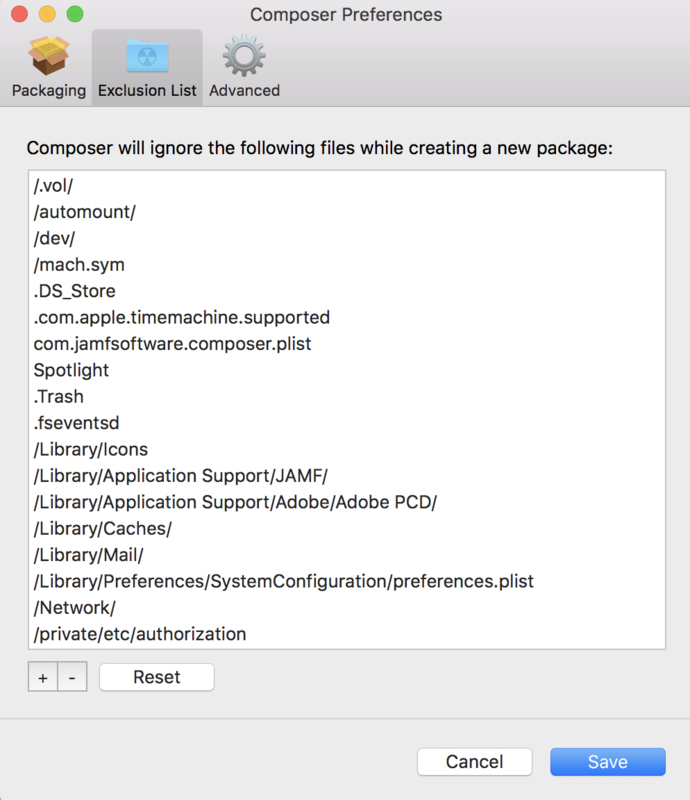 Composer allows you to manage Package preferences from the pane in the screen shot below. By default, Composer builds flat PKGs. Flat PKGs consist of a single file and allow for easier and more reliable deployment than non-flat PKGs. You cannot view or change the contents of a flat PKG after it is built. This option allows you to sign flat PKGs with an installer certificate (.p12) obtained from Apple. Signing PKGs with an installer certificate makes it possible to verify that the PKG was created by an identified developer. It also allows users to install PKGs on computers that have Apple’s Gatekeeper feature set to only allow applications downloaded from the Mac App Store and identified developers. To sign flat PKGs, Composer must be running on macOS 10.7 or later. Select the Sign with option and choose an installer certificate from the pop-up menu. Installer certificates that are located in the login keychain in Keychain Access are displayed in the pop-up menu. Note: The pop-up menu also displays application certificates that are located in the login keychain in Keychain Access. It is important that you use an installer certificate, not an application certificate, to sign flat PKGs. For instructions on how to obtain an installer certificate from Apple, see the Obtaining an Installer Certificate from Apple Knowledge Base article. To install a signed PKG, computers must have a Certification Authority intermediate certificate from Apple in the System keychain in Keychain Access. For instructions on how to obtain this certificate and import it to the System keychain on managed computers, see the Importing a Certification Authority Intermediate Certificate from Apple to the System Keychain Knowledge Base article. Enabling this option ensures the removal of any files that disturb the way Finder windows are presented on a user’s computer. Any .DS_Store files necessary to configure views of deployed files and folders will not be removed. Scanning images when building a DMG calculates the checksum and stores it in the DMG. The checksum is used to ensure proper installation of the DMG package. Composer plays a sound each time a package source is created or deleted. 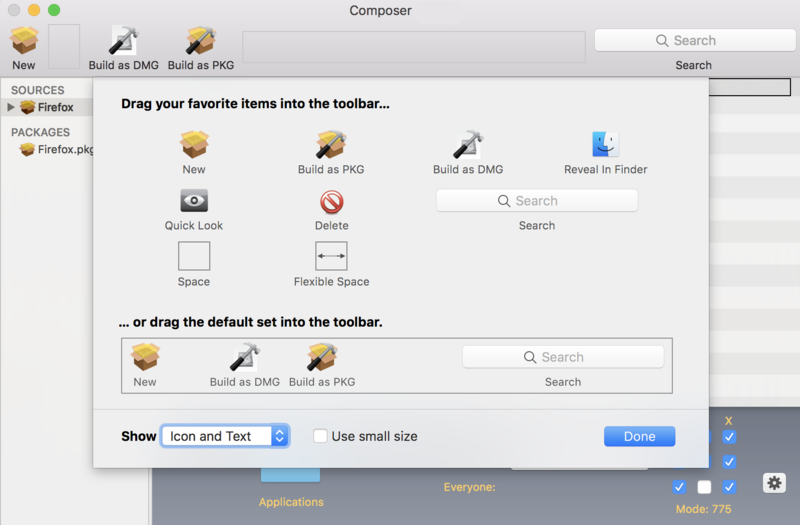 When this option is enabled, Composer reveals newly built packages in a Finder window. The exclusion list allows you to specify files and folders that should be ignored when creating a package using a snapshot or file system monitoring. To view the exclusion list, click Exclusion List in the toolbar. A list of common files and folders is specified by default. To add and remove files, use the Add (+) and Delete (–) buttons at the bottom of the list. Composer allows you to manage some advanced preferences from the pane in the screen shot below. When Composer creates a package source, it copies files to a work directory. This work directory must have privileges enabled. To change this directory, click Change, or hold down the Option key when you open Composer. The default bundle identifier is used when creating the info.plist file for a new package source. 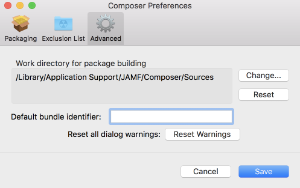 For example, if the default bundle identifier is “com.jamfsoftware”, and you create a package source named “Composer”, the bundle identifier for the package source is “com.jamfsoftware.composer”.